villa sur trois niveaux avec grand salon et de grandes fenêtres donnant sur le lac. Nous avons passé une excellente semaine dans cette très belle maison, spacieuse et confortable. La terrasse a une vue superbe et la petite plage à deux pas est très appréciable. Il est également très agréable de pouvoir aller à pied dans le centre d'Orta San Giulio. Et inutile de préciser qu'il y a plein de très belles visites à faire dans la région. Milan est également accessible rapidement. Nous espérons revenir très vite ! Villa Pinin is about one hour's drive from Malpensa airport and it's easy to find. The owners greeted us, showed us how everything works and made us feel welcome. The main living areas are spacious and the beds are comfortable. The kitchen is adequate. There are 3 bathrooms, so no problem with queues for a shower. The ladies would have liked some full-length mirrors and the towels supplied were definitely due for replacement (hence 4 stars rather than 5). The best feature for us without doubt was the terrace and lawn. We liked its elevated, South-facing position with views over the lake. It isn't overlooked by other properties and the derelict half-finished hotel behind the property doesn't make its presence felt. A small beach and jetty (there's a canoe in the garage) are a short walk away and it takes only 10 minutes or so to stroll into the lovely town of Orta San Giulio. This can get busy, especially at weekends, but once the day trippers disappear it's a charming place to spend some time, with a good selection of restaurants and bars. Our favourite excursion by road was the Simplon Pass but probably the best day out we had was when we hired a small motor boat from a place in Pella and were able easily to see the entire lake in our own time. We also enjoyed the Alpyland ride at Mottarone -- it's closer to Orta than to Maggiore but you need to go to Stresa to catch the cable car, however the drive to Stresa across the mountains is beautiful and well worth the effort. The Sacro Monte above Orta San Giulio can easily be reached on foot; a weird place but we found it interesting. We were very lucky with the weather but if it had been cold or wet there were cards, games a TV and WiFi to keep us entertained (although the WiFi is a bit iffy and had to be reset once or twice most days). All in all, we were very pleased with Villa Pinin and would recommend it. Thank you for taking the time to write us a feedback, we have been constantly improving our facility and our services to create an excellent experience for our clients. Our Wi-fi provider is the best on the market but unfortunately Villa Pinin is located in a sort of "Valley" and sometimes it gets unstable, I hope it didn't cause too many problems. I always provide 8 big towels, 10 middle size and 10 small size towels but unfortunately I'm not present at the Villa to make the laundry. Our house has a laundry room with iron and washing washing. I really hope to host you again in our house. The property was advertised for 8 people but we were 6 adults and 3 children but the owner was more than happy to accommodate us all and kindly placed an additional bed in one of the 4 bedrooms. 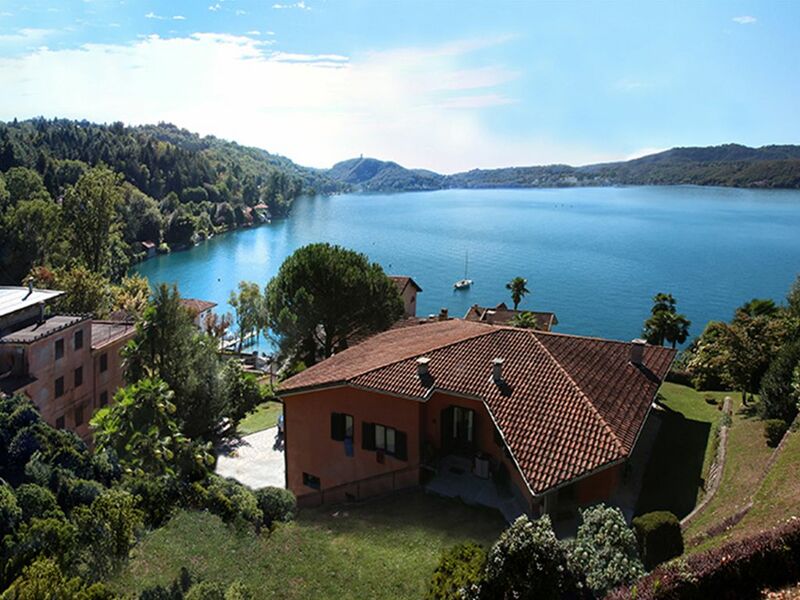 The property was well kept with a large living area and a patio and lawn with fantastic views of Lake Orta. It was also within 10 metres of lake access for swimming which we took plenty of advantage of often more than a few times a day and although the lake access was public and well used by other visitors we never had difficulty finding a spot for our towels and numerous pieces of swimming equipment for the children. The property was a convenient 10-15 minute walk into the centre of Orta San Guilio where we were spoilt for choice for real Italian ice cream and an excellent variety of restaurants for all budgets. It was noticeable that the shops and restaurants represented good value even for a week pound and much cheaper than France and Switzerland, where we stayed on route. It was also an easy 30 minute drive to the top of Mount Mottrone where there were stunning views and the Alpyland ride, loved by both children and Adults alike. Orta is a beautiful location and much less crowded than nearby Lake Maggiore. The only downside to the property was the relatively small kitchen, but this was in part because there were 9 of us and unfortunately we understood local law prevented barbecues. However we given the good value we ate out most evenings and tended to use the kitchen for making sandwiches etc so it's wasn't really a problem. Sehr zu empfehlen., auch wenn die Anzahl der Gartenmöbel für eine Maximalbelegung von acht Personen etwas knapp bemessen war. It took years to expand the ground because Orta San Giulio is protected by the Fine Arts and requires so many permits. Wir haben uns sehr wohl gefühlt in der Villa Pinin. Fast direkt am Wasser mit einem traumhaften Blick über den See. Die Vermieter waren sehr freundlich und zuvorkommend.Alle Absprachen und Vereinbarungen haben hervorragend geklappt. Das Haus und der Garten drumherum waren sehr gepflegt und mit allem Nötigen ausgestattet. in der Nähe geben gleichzeitig die Gelegenheit zur Erholung wie zur Abwechslung und zum Genießen. Besonders gute Restaurants waren für uns auf der Insel "San Guilio", das Britain und das "Antica Agnello" in Miasino sowie unter den unzähligen Eisdielen das "Artigiano Gelato" in Orta, Via Olina. Orta San Giulio fait partie de la région touristique des lacs, qui comprend le lac Majeur, le lac de Mergozzo, et les montagnes et les vallées de l'Ossola.